Don't go up to the top room. Don't go out to where the fruit grows. Don't take the shortcut across the field. Don't go near the cow. Don't go near the gooseberries. Never mind your Houdan cockerel. It was ill; its leg was infected; it had to die. And besides, have you not had the brain fever, Chickie? You are ten. You may not last much longer. Do not listen to your Aunt Augusta, listen to your Aunt Tom. Do not listen to your Aunt Tom, listen to your Aunt Augusta. Listen to your grandmother. You may go to another party next Christmas, if you should survive, Chickie. But you must not eat the food. Your grandmother will feed you brandy when you return, in case your system has been poisoned. You and Ethel. And your brother Charlie, boarding at Pencarrick School now, in Littleham. You must be obedient, or you will be punished. Do not play with the paint. Do not expect any plaudits from me. The doctor has pronounced. You must lie in bed, Chickie, very still. Do not breathe too much fresh air. Do not play on the grass. Do not play on the gravel. Do not, under any circumstances. 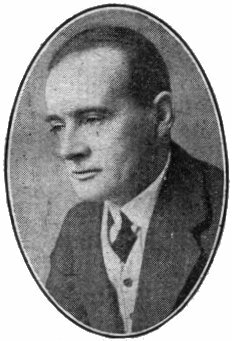 Hector Hugh Munro was the third of three children of Charles Munro and Mary Frances Mercer, and he had, as a child of the empire, been born in Akyab in Burma on December 18th, 1870. His father was an officer in the military police. A cautious and thoughtful man, Charles had arranged for his wife to return to the family home in Devon when, in 1872, she became pregnant for the fourth time. Birth had been hazardous in Burma, where Hector and his elder siblings Ethel (1868) and Charlie (1869) had all been born, all of them of uncertain health, Hector in particular. Home was Pilton, an outcrop of Barnstaple, on the North Devon coast, where Charles Munro's widowed mother lived with her two unmarried daughters, Charlotte and Augusta. Charlotte was almost twelve years older than Augusta; she was also always known, improbably, as "Tom", after an allegedly tomboyish childhood. It was the winter of early 1872. Mary Munro was out walking down one of the high-hedged lanes near Pilton. She was 29. There was an aggravated, rumbling sound; the clop of stumbling feet; the sweet scent of cow-dung. A cow, separated from a herd, careered into view, and shunted its full, careless weight against Mary. It cost her unborn child; it also cost her life. The three motherless children became from that moment the unexpected charges of their grandmother and their aunts, aunts to whom children were at best a peril, and at worst a tribulation. All three were subjected to volleys of instructions, for the most part about what not to do, when their father returned to Burma. About children, they had not a clue, other than that, if they were sickly, they should be nursed, and if well, they should take care not to infringe a thousand natural laws. Hector, as the most susceptible to illness, was a little more fortunate than his elder brother Charlie. Hector was never birched. But in all other respects, Hector had to endure the orders and imprecations of his aunts, who lived up to almost every storybook stereotype of the spinster. It did not help that they also disagreed with one another, and competed remorselessly in their parsimony, which was constant. It was at its height in 1881. As a boarder, Charlie had been sent some money to spend at his school, by his father. The aunts held on to the allowance, and were subverted only by Ethel and Hector, who sold some books, sent Charlie money, and wrote indignantly to their father. As children, the Munros exacted a variety of revenges, of which Ethel recalled a particular favourite. A boy called Claud, the child of a family friend, was allowed to pay a visit in the summer - a rarity, this was, to meet other children. Claud was lauded by the aunts as "a good boy", one "who always does what he is told." Hector saw to it that Claud was involved in a series of scrapes throughout the day, and his reputation damaged beyond repair. On the rare occasions when Hector was let loose at a party - at Christmas - he invariably started a punch-up with the nearest victim he could find. Otherwise, fair-haired, pink-cheeked Hector, with charming blue-grey eyes, was remarkably even-tempered. In later life, Hector, who had been known to the aunts as "Chickie", would have a more particular revenge. He is much better known as the short story writer, Saki, and his tales are full of objectionable aunts, none more so than Mrs. de Ropp in Sredni Vashtar. Mrs de Ropp is a bully who tells a ten-year-old boy, Conradin, that he is doomed to die. She discovers that he has a Houdan hen - as Hector had had a Houdan cockerel - in a potting-shed. She has it destroyed (just as Hector's cockerel was destroyed, when a vet might have saved it). What the myopic Mrs de Ropp does not know is that there is also a polecat ferret secreted in a cage, in the same shed, and which Conradin worships. Into the shed she goes. The story concludes with the blood-flecked ferret languorously leaving the shed, while Conradin eats the buttered toast his aunt has forbidden him. The model is the bullying Aunt Augusta, the most particular tyrant. It is easy to paint the childhood of the Munro children as grim. However, this is about as logical as suggesting that Pollyanna had a bad time. The unsainted, warring aunts provided the three imaginative children, Charlie, Hector, and 'Scarabee' (Ethel) with the motive to bond together. In an area in which there were few children, they created their own outrageous rigmaroles, and lived in pleasurable defiance of their elders. Hector and Ethel became incorrigibly close - for life. About their only dispute was over rooks - she had a pet rook; he had a lifelong loathing of them. Ethel resisted any suitors; Hector discovered in his teens that he was gay. And his father returned to the fold when Hector was 17, taking his children abroad - to Dresden, to Innsbruck, to Paris - earning Hector's perpetual admiration, not least for taking their practical jokes in good part. He later settled in Westward Ho, south of Barnstaple, where his regime was somewhat different from that of his sisters: he nailed the windows open. He thought of re-marriage, but Ethel put the kybosh on his proposed engagement to an Ethel Dodd. Hector had a pointless stint in the 1890s as a military policeman in Burma, where he kept a tiger-cub as a pet, and succumbed to fever after fever, and eventually to malaria. He soon returned and made his way to London. He wanted to be a writer; his father subbed him generously. In London at the end of the century, Hector worked on a history of the Russian Empire - an ambitious opening project, for which he was not exactly qualified. He had indeed spent only a few years at school, including four unmemorable terms at Bedford Grammar School. His learning came from a succession of governesses, and a voracious enjoyment of reading. He would not be remembered as a historian. His father's coachman offered a memorably damning compliment: "I've read your book, sir, and I must say I shouldn't care to have written it myself." As a person, he was fastidiously cool rather than flamboyant in manner and in dress. Still, sallow, obsessed with wild life from birds to wolves, he was lean, quiet and witty; his hair grew dark; and in a decade following the d?bacle of Oscar Wilde, he was cautious. He shared Wilde's love of a well-turned phrase as well as his sexual predilections, and although he enjoyed the culture of the Turkish baths, and had an active libido, he kept his sexuality under wraps. It was coincidentally in the year of Wilde's death, 1900, that Hector Munro's career took off, and when he first appeared under the by-line Saki. His parodies of Alice in Wonderland, political spoofs, appeared in The Westminster Gazette under that name, and proved instantly popular. Under his own name, his first short story appeared a year later, as did another sequence of Saki articles featuring a new, louche character called Reginald, whose witty retorts were also admired. He took his pseudonym from The Rubaiyat Of Omar Khayyam - Saki is the cup-bearer mentioned by the speaker. It is easy to see why the pensive, meditative, proverbial, skeptical but essentially good-natured words of the Rubaiyatshould have appealed to Hector. Hector's Aunt Augusta had died in 1900 (the older Aunt Tom survived until 1915), but his flow of short stories did not really begin for another decade. In the intervening years, Hector had a career as a foreign correspondent for the Conservative paper The Morning Post(merged in 1937 with The Daily Telegraph). At first, he reported from the Balkans; later from Warsaw, St. Petersburg and Paris. He wrote fast - "so quickly he might have been sketching", according to fellow-journalist Roy Reynolds (the first and only friend who was also gay). He made up in style what he lacked in political insight. His tendency was to side with the authorities, rather than any insurgents; he had grown up with an ineffable sense of his own superiority (or perhaps the inferiority of others). He could be casually racist, misogynist; he could be politely misanthropic. He was too sardonic by nature to waste time on an underdog. His sister Ethel was from the same mould. Astonishingly, she was on holiday with Hector while he was in St.Petersburg, and watched with him the 1905 march on The Winter Palace, during which the civilian protest against the Tsar was ruthlessly countered by sabre-wielding Cossacks, and by guns which left several hundred dead. It was a not a revolution with which Hector had any sympathy. Hector, an able linguist and by now an experienced writer, returned to London after his beloved father's death in 1907. He inherited enough money to buy a cottage in Caterham in Surrey, where he installed Ethel (his brother Charlie was by now about to become the governor of Mountjoy prison in Dublin). He also gained sufficient financial freedom to be able, for instance, to support Diaghilev and Nijinsky with a reception when they first came to London, after they had initially received an indifferent response. Otherwise, he remained prudently on the fringes of the London literary scene, whilst securing his niche in literary history with his acerbic stories, and writing indifferent verse for the Express. (His publisher, John Lane, had been Wilde's, too; Lane was slightly unnerved when gossip about Hector's sexuality began to circulate). He had few close friends; his younger second cousin, Willie Mercer, was struck also by how seldom, if ever, he laughed, and how infrequently he made witty remarks (Mercer was later successful as the thriller writer Dornford Yates; like Saki, he is often thought to have been anti-Semitic). He was addicted instead to the pleasurable silence of games like bridge. Although Hector Munro was tempted into writing a novel, The Unbearable Bassington, it wasn't the match of his short stories, which were rooted in the late Victorian and Edwardian worlds his readers found comforting. His second, and only other novel, When William Came, was an attempt at a wake-up call about the impending war, and about what Hector considered the growing weakness of the English (the novel is set in the aftermath of a German conquest of Britain). It was published in early 1914. By this time, Hector Munro the ironist, the hoaxer, the animal-lover, the isolate, was ready for war, and enraged by the pacifist leanings in the newly successful socialist parties. He was quick to enlist when the war came, by which time he was 43. But he was also determined to join up as a trooper; officer status would have been easy to obtain, and was indeed offered. For Hector Munro, however, the war was about knuckling down, perhaps even about refuting those suggestions of physical fragility in his childhood - perhaps also to knock on the head suggestions that he was in any way effete. He also took a boyish pleasure in the rough-and-tumble of the work and play of the soldier's life, in the outdoors (he had already concocted a mental plan to live in the Siberian wilds, closer to nature, when the war was over). The articles he wrote in 1914 and 1915 are scathing about the namby-pambies who shirked their duty. He was an assiduous soldier, soon promoted to corporal, and eventually to lance sergeant. He had ambitions to take part in a bayonet charge; when Ethel waved him off after his leave in the summer of 1916, she shouted "Kill a good few for me!" If the war depressed him, he did not reveal it. He wrote a lyrical article for the Westminster Gazette on "Birds On The Western Front", about skylarks and chaffinches continuing to raise their young in the wreckage of the woods and fields. Malaria felled him again, but he discharged himself, reporting back just in time to take part in another assault on that notorious killing-ground on the Somme, Beaumont-Hamel. At four o'clock in the morning on November 14th, 1916, Hector Munro's company was crawling through the mud. There was a welcome lull in the gunfire. It was jittery-cold, dark, and thick with mist. As he leant his head back against the edge of a crater, Hector Munro spotted a soldier committing a cardinal error in a nearby trench - lighting a match for a quick smoke. "Put that bloody cigarette out!" called Hector. Almost simultaneously, the sniper's bullet exploded in his head. Ethel Munro was careful to destroy or to censor many of her brother's papers. In later life, she travelled eccentrically with three dolls - Teddy, a puppet-bear; Wilfy, a rabbit; and one Master Owl. 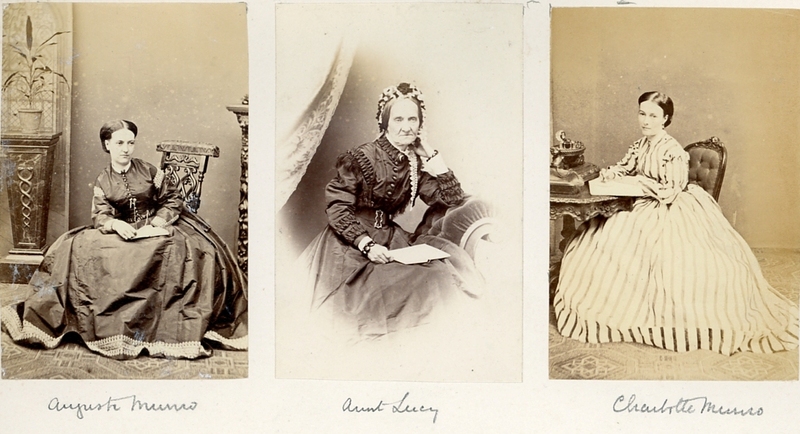 I am grateful to Jan wan der Wal, Almelo of The Eastern Window website for permission to share these images of Saki's aunts and grandmother, by whom he was brought up.